Let's move forward with stronger pet food safety standards. It's time! 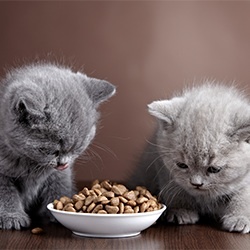 Pet food has long been a source of worry for pet owners and health officials. Reports of salmonella contamination are frequent, and threaten not only animals eating the food but also the owners handling it. Nutritional deficiencies and toxins have been found in pet foods as well — including melamine, which has led to multiple pet deaths. The FDA’s new proposal includes safety requirements similar to those in place for manufacturers of human food, ensuring that manufacturers are proactive in their efforts to keep pet food safe. The current system is reactive; the government does not respond to pet food safety issues until after they are reported. In the past, it's taken weeks of reports from consumers before contaminations were discovered and recalls announced, and thousands of dogs and cats are believed to have died. This long-awaited move by the FDA is likely to be opposed, and possibly diluted, by large pet food manufacturers and importers. Make your voice heard now: It’s past time for the FDA to help ensure that the food we feed our pets is safe! What does the FDA want to do? The FDA is proposing that pet food companies follow rules very similar to those that manufacturers of human food must follow. That means that companies that take part in manufacturing any pet food component would be required to keep a record of, monitor for effectiveness, and report their manufacturing practices. Important pieces of this include sanitation, hygienic practices and training, processes and controls, storage and distribution of pet food, and equipment design, use and maintenance. Manufacturers would also need to perform a hazard analysis to understand what might go wrong for each kind of animal food they make, and then put in place measures to minimize or prevent potential hazards. As you know, the discovery and recall of contaminated pet food happens on far too frequent a basis. Recalls of pet food due to salmonella contamination are announced regularly. The melamine scandal of 2007, which caused the tragic loss of thousands of beloved pets and even made it into the human food supply via chicken feed, serves as a warning of how sweeping pet food contamination can be. I am incredibly supportive of your proposal to enact stronger pet food manufacturing safety regulations similar to those in place for food for humans. No doubt you will receive many communications from organizations determined to dilute and weaken your proposal. I choose to support strong regulation to protect health and lives. Please continue to consider the health of our animals and our population, and enact these regulations faithfully and completely. BREAKING NEWS: JUNE 23rd, 2016 - Radagast Pet Food, Inc. of Portland, Oregon has announced a voluntary recall of four lots of its Frozen Rad Cat Raw Diet, which may be contaminated by Salmonella and Listeria monocytogenes. Untreated, a Listeria infection in a cat can result in paralysis and swelling of the brain. This recall comes on the heels of the 35+ recalls that have occurred in the past year. Our pets deserve better. Remind me to click daily at The Animal Rescue Site (manage and customize your newsletters any time). That's 76,429 signatures! Let's keep the ball rolling.